Since we started to talk about the bottom toolbar in our last lesson (click here), in our look at Media 100, I thought in this would be a good lesson to talk about what some of the other parameters in the bottom toolbar do. Starting at the left, these controls are designed when you want to have elements either roll or crawl though a show, or in situations where you might want to create a credit roll or crawl. 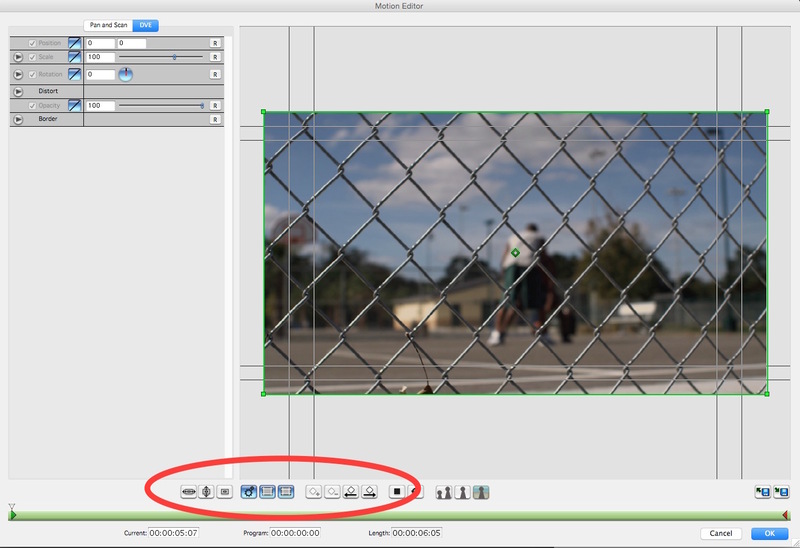 Once you activate the parameter, you clip will immediately conform to starting and stopping at the start and end of clip, respectively. The next parameter I want to talk about is the “Toggle On Screen Controls” option that we talked briefly about in the previous lesson. Once you activate this parameter, not only does it add the bounding box to your clip, so you can easily manipulate it in the canvas, but you will now also have access to Safe Title/Safe Picture. This is a much needed tool, especially when you’re dealing with text in your shot. Now, the last parameters I want to talk about in this lesson are the keyframe parameters. Two buttons give you the ability to add or remove keyframes from your timeline, and the other buttons let you either jump forward or backwards to easily navigate to a specific keyframe location. Once you get rolling, you’ll quickly notice that these parameters are pretty self-explanatory, so I thought for our next lesson, we’d start about keyframe manipulation in the Motion Editor. I will quickly create a basic animation, so you can see how the keyframes work! Click here to learn more about Media 100, and it’s now free! Check back soon for more Media 100 tutorials!